Any director with the balls to title their film The Man Who Killed Hitler and Then The Bigfoot has got to have a little bit of chutzpah to even attempt to do it justice. Unfortunately, first time feature director Robert Krzykowski doesn't, and what starts out as an interesting attempt to take on aging and the regrets we gather as we move toward our twilight years ends up looking a like a cheap imitation of better films with a dash of gore thrown in to placate the genre film fanatics. Legendary character actor Sam Elliott (The Big Lebowski, Roadhouse) is the titular Man, Calvin Barr. A aging veteran who looks at the life behind him with sadness and a sense of ennui. We begin the film with a young Calvin Barr, played by The Hobbit's Aidan Turner on a secret mission to assassinate Hitler by infiltrating his compound and utilizing a makeshift pistol to to the deed. This is the first of many, many, *many* flashbacks we'll experience through the mind's eye of the elder Calvin Barr. Rather than celebrating these memories or capitalizing on what could've been massive fame, Barr is forced to live in silence about his past, and with regret for the life he took, even though he likely saved millions in the process. Calvin Barr is a simple man, a man for whom his mission was to do what was best for his country, even if he didn't believe that he had the moral or ethical right to kill anyone, even Hitler. The film doubles down on Barr's sense of regret by replaying virtually every moment of his young life numerous times and showing how it's affected in the present day. A permanent resident of a local barstool, with no real relationships to speak of, Barr lives in an eternal funk. One day a pair of government operatives visit the elder Barr to tell him that The Bigfoot is on the loose and is responsible for a spate of deaths currently being attributed to a Canadian serial killer. More importantly, these agents tell Barr that he's the only one who can stop The Bigfoot by putting him down and potentially saving the entire human race. Loathe to get back into the killing business, Barr's initial response is to send them packing, but he eventually takes up the challenge and the hunt is on. There is nothing about this story that isn't bursting with potential and possibility. This just makes it even more painful when the film squanders all of the goodwill it has gained simply by allowing Sam Elliott to chew scenery like nobody's business. The problem is that the film feels very hastily put together, in spite of its good intentions. Sam Elliott is a national treasure, and I can see what would draw him to the role. The character of Calvin Barr is actually quite good, sympathetic, riddled with pathos, and a prime entry point for the audience. However, the mechanics of the film just aren't quite there. Scenes seem cobbled together, edits aren't as crisp as they should be, and there's far too much flashback and not nearly enough action. The film wants to be a cross between Inglorious Basterds and Bubba Ho-Tep, but it's actually more of a cross between a bromantic version of The Notebook and Redneck Zombies, and not in a good way. Director Krzykowski forgets to make the film fun, instead focusing on the relationships between characters like the one between the younger Barr and the girl he left behind to go to World War II and the relationship between the elder Barr and the little brother he left behind to go to World War II. The performances are all perfectly acceptable, and the scenes between Elliott and Larry Miller as his younger brother are actually quite touching, however, the editing and lack of a clear vision about what the film is supposed to be make the experience feel dull and unfocused. The titular killings only take up about 10 of the film's 98 minutes, leaving the rest of the film to meander about in Calvin Barr's memories, which wouldn't be terrible if it weren't so poorly edited. A good recent comparison in terms of tone would be the work of S. Craig Zahler. Zahler's Bone Tomahawk and Brawl in Cell Block 99 work with largely the same ideas; flawed, regretful men take out of their comfort zones fighting for survival. However, where Zahler succeeds is that he realizes that the film only succeeds if the audience gets to experience a violent catharsis with the protagonist. What The Man Who Killed Hitler and Then The Bigfoot does is wallow in the misery and loneliness of its characters, and that's a very different thing. I went into this film with an open heart and an open mind, but The Man Who Killed Hitler and Then The Bigfoot left me flat over and over again. Not really a drama about aging, definitely not an action movie about hunting Bigfoot, and certainly not an effective mix of the two, the film fails to grab the audience beyond the initial goofball idea of Sam Elliott as The Man. If they'd managed to capitalize more of the possibilities of Barr's struggles, or deliver a good enough amount of action to make the talky bits more worthwhile, I'd be singing a different tune. 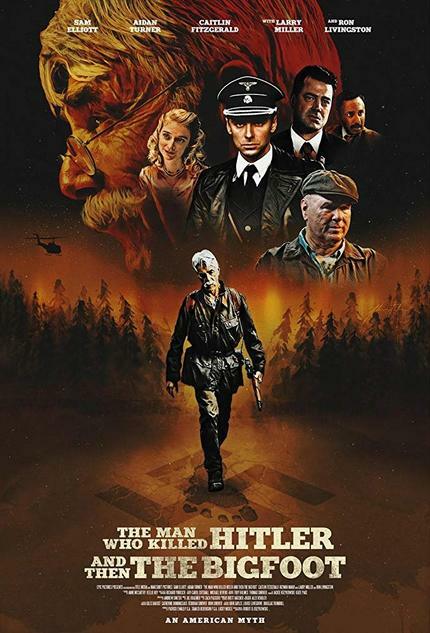 As it stands, though, The Man Who Killed Hitler and Then The Bigfoot is an uneven attempt at telling too many stories and succeeding with none.